Bulletproof, easy to use status pages for your web application or service. 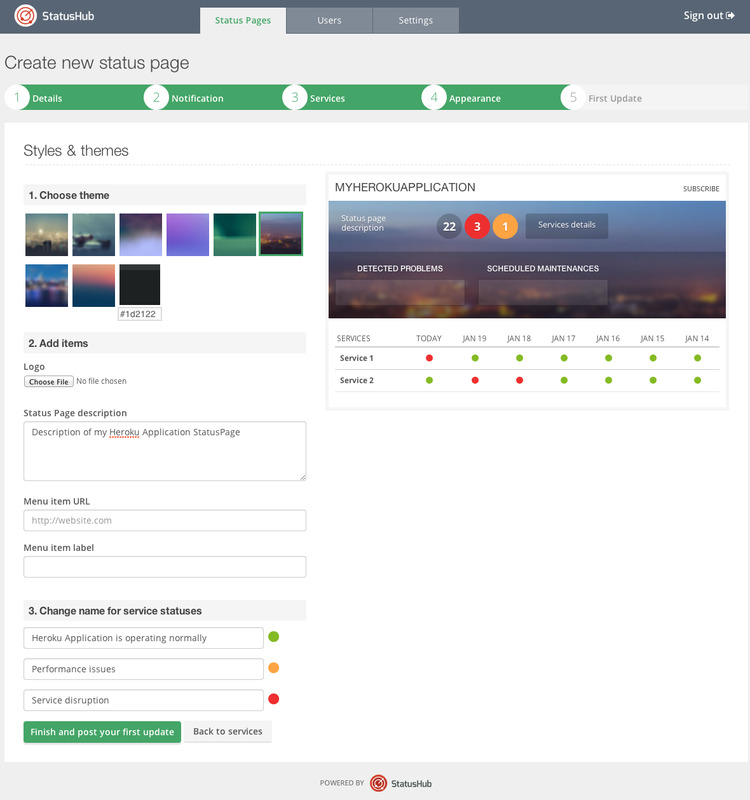 StatusHub is an add-on which provides hosted status pages for web application or service. Adding StatusHub to your app will create your custom status page for Heroku and give you ability to add custom services to it. StatusPage provides couple color themes to choose from and ability to customize your status pages (logo, description, services statuses). StatusHub visitors can subscribe for updates for your status page. 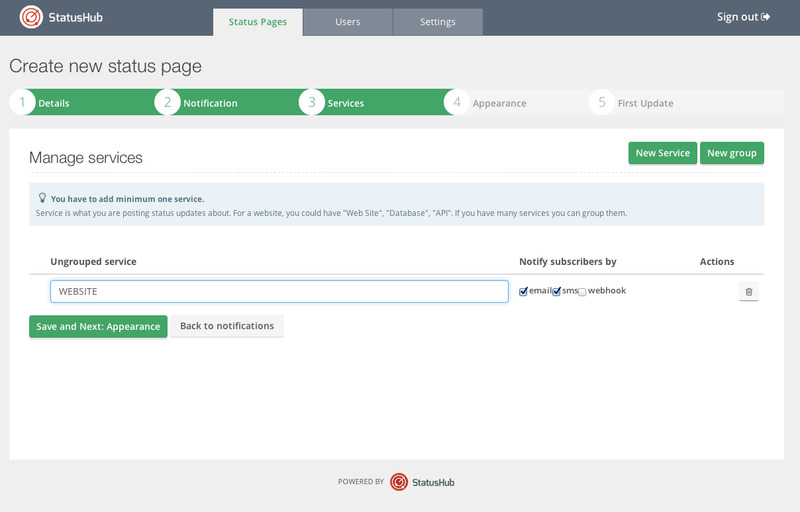 Notification channels include: email, SMS, Twitter and webhook. After installing StatusHub the application should be configured to fully integrate with the add-on. When you first log into the StatusHub application, you will see a 5 steps form similar to the one below. The only required fields are subdomain and name which are automatically pre-filled with your app name. 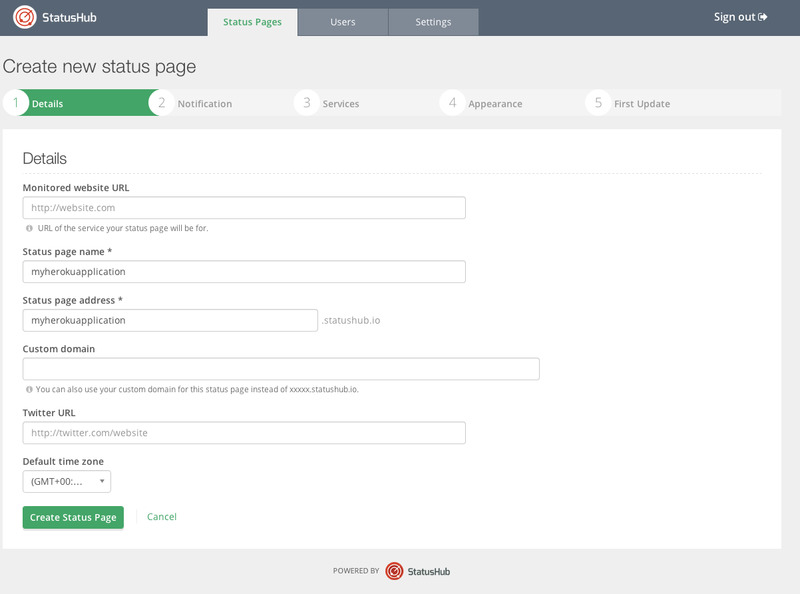 Customize status page details or leave them empty and click “Create Status Page”. In a second step you can customize notification services and change email address for email notifications. In this step you define application services as needed. Here you can specify name for it and change way of notification. 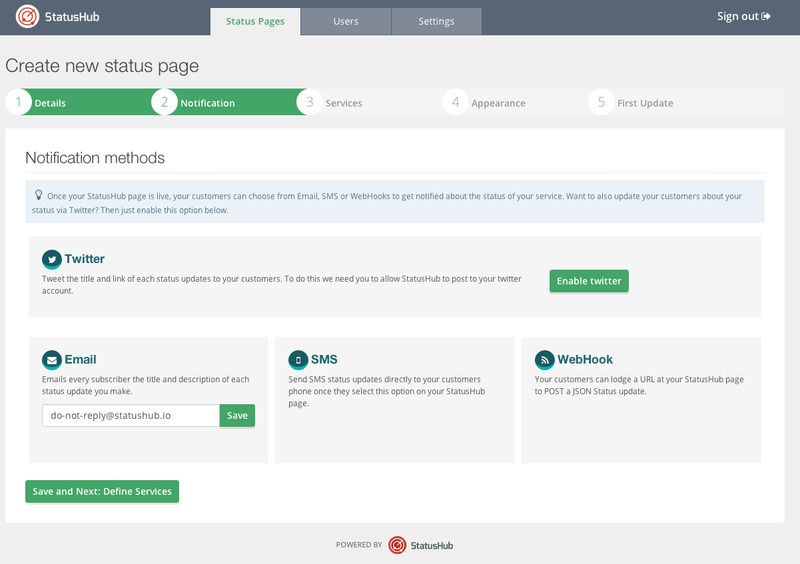 In this step you can customize status page look or leave default styles. 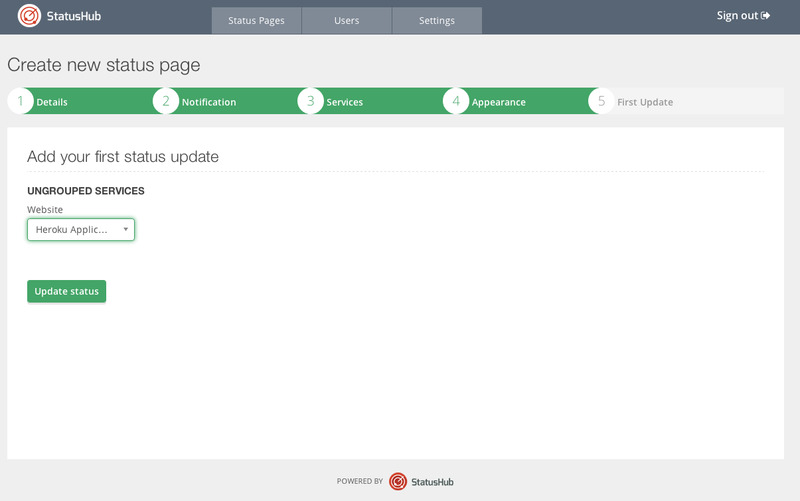 Last step will create initial status update for status page. You can also set status updates for your services. Clicking on “Update Status” will redirect you to newly created status page. 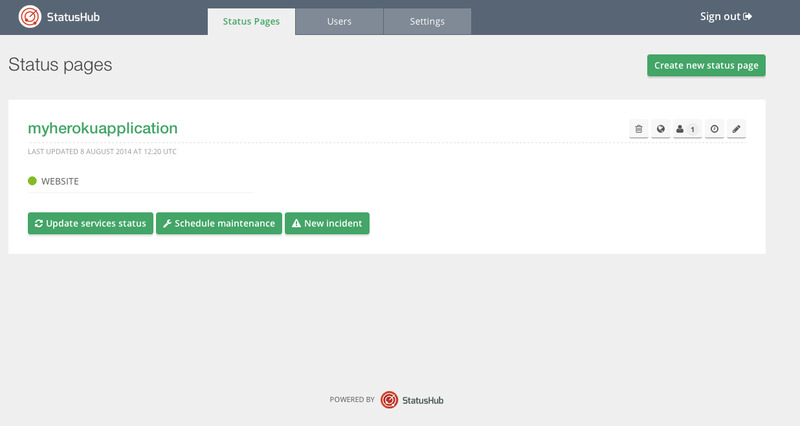 The StatusHub dashboard allows you to manage your status pages. You can see current statuses of your services here. You may add status update to your status page, create an incident or schedule maintenance. You can also add new status pages from this place. Clicking on “Edit Page” allows you to customize your status page. You can change details, notifications details, appearance and add services. Clicking on “History” takes you to the panel where you can manage all your previous status updates, as well as incidents and maintenances. Click “Manage Users” if you wish to see the list of your subscribers. or by visiting the Heroku Dashboard and selecting the application in question. Select StatusHub from the Add-ons menu. StatusHub can be removed via the CLI. All StatusHub support and runtime issues should be submitted via on of the Heroku Support channels.